(Newser) – The riots that at times roiled France under Nicolas Sarkozy aren't ceasing under Francois Hollande. 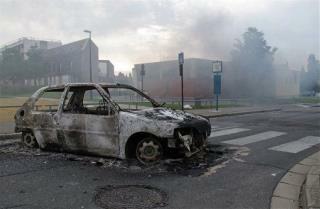 Some 100 youths clashed with police in the impoverished city of Amiens overnight, with rioters reportedly torching cars (in at least three cases dragging drivers out of them in order to do so, reports the AP) and firing buckshot at cops. Reuters attributes the eruption to frustration over spot police checks on residents. Officials say 16 officers were injured, one seriously. Next on Newser: Newest Border Agent: a Blimp? I bet they were Muslim. Holy crap, when you keep a person down, impoverished, they revolt. How dare they. Kind of like the blacks in the US in the 1960's. It seems every klan member has posted on this thread.